Today we launched our new online home for Northumberland Day – www.northumberlandday.co.uk – to showcase all that is great about Northumberland Day and give every type of event organiser, from a village hall or community group, to a business, school, art group or food producer, a great platform from which to publicise their event, activity, food sampling and more. While Northumberland Day is May 27 2018, events and activities are currently running from May 19 to June 2 and possibly further into the first week of June. We already have some fabulous events in our visitor-friendly new events section, which even has Google mapping to show visitors how to make the most of them. 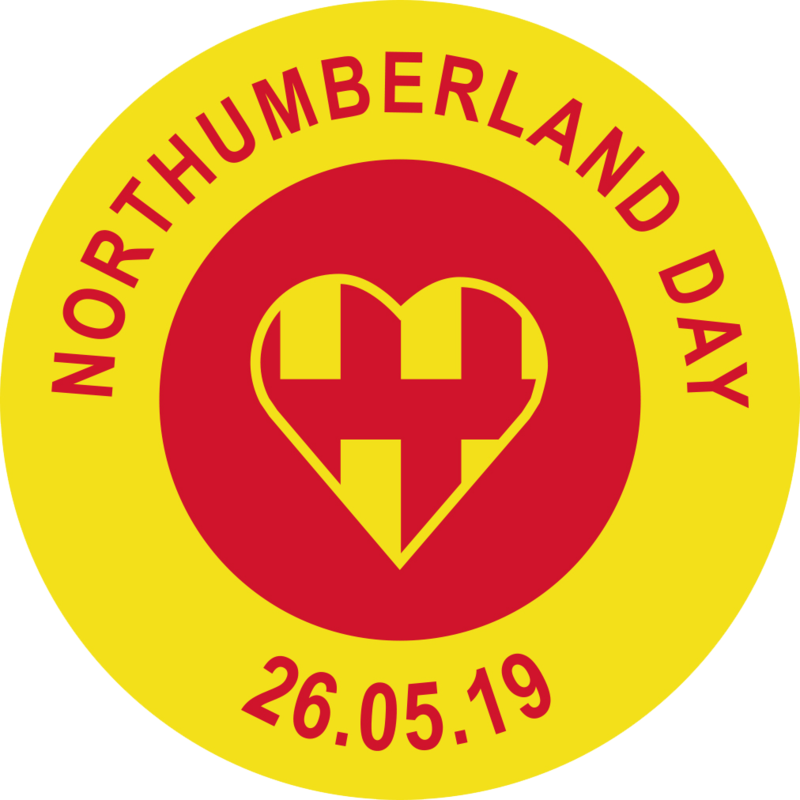 Northumberland Day’s ‘mum’, Jane Hunt, commissioned the website, but could never have managed to get this sorted out without the generosity of web guru, Nicky Gyles, at Pencil to Pixel and graphic designer, Jaimie Clegg, who created the logo and our 2018 graphic, which shows the Northumberland Day heart being nurtured in a woman’s hands. Their enthusiasm, and willingness to listen to Jane’s pleas, has demonstrated true care and commitment. It’s amazing that none of this trio live in Northumberland or are Northumbrians. I guess we’re all just wannabe Northumbrians, or adoptees. The new website demonstrates our commitment to seeing Northumberland Day grow, year-on-year, embedded at a grassroots level, which will give it sustainability, along the lines of Yorkshire Day. We have fought hard to retain the initiative’s independence, for that very reason. When the time comes, we will let the community take over, but for now it needs someone to keep the plates spinning. The need for a new online home for Northumberland Day became pressing following Northumberland Day exhibiting at the two North Tourism Fairs, where vibrant, exciting and inclusive ideas for all sorts of events suddenly appeared in the planning pipeline. One of the events already enjoying its new profile at the Northumberland Day website is a SMILE Through Sport disability sports morning, which will enable participants from across the county to have a taster session of three disabled sports, athletics, boccia and cricket. To inspire those taking part, this event, being staged at the Willowburn Sport & Leisure Centre in Alnwick on May 22, will be attended by champion Paralympic club and discus-throwing athlete, Stephen Miller MBE. Villages which have already planned their activity include Beadnell, Norham and Boulmer. Other participants already promoting events and activities in the other part of the county are Hexham Racecourse, Tynedale U3A, Tyne Valley Art Fair, Hexham Ramblers and Langley Castle. Langley has a full day of activities on Saturday May 26, which will include falconry, art, craft and food stalls, tours of the castle led by Kevin Robson of Wild Dog Outdoors, music from the Sunshine Panners, children’s activities from Kielder Garden Services and Wild West activities from Children’s Centre West. There will also be a re-enactment of the Hexham Massacre by Time Bandits and another surprise reveal. But it’s not just a new online home for Northumberland Day that is creating massive interest. The new website also now carries a section that is completely focused on schools, with an education flyer, to give schools ideas and inspiration, and a supporting education pack. Both are free resources that can be downloaded from the website. The education pack focuses on two great Northumbrians – Grace Darling and George Stephenson – and highlights how their contribution to life in the county made such a big difference to the lives of people all over England. Suggested activities based around these great figures include having pupils examine concepts such as bravery and selflessness and the importance of dreams and goals. They can create stories spinning from Grace Darling’s actions and take a look at the Industrial Revolution and how it changed lives. They can even design their own stamp, with one pupil winning the opportunity to have their design made into a Royal Mail stamp. The education pack also has a focus on Northumbrian food and drink, from mead to kippers, and has activities linked to the Northumbrian language and the county’s flag. Finally, it looks at one of the county’s lesser-known landmarks – LV50 in Blyth Harbour – providing information about this important historic vessel, but also offering one primary school class the opportunity to visit and learn out more first-hand. This is thanks to the generosity and enthusiasm of the Friends of LV50, who cannot wait to introduce their wonderful lightship to one class of children. Jane met volunteer, Doreen, at the Alnwick North Tourism Fair and everything has gone from there, with Jane then interviewing another Friend of LV50, Lester Sher, to put the education pack – and special prize – together. The Friends of LV50 have also planned a Northumberland Day event, which will take place on May 31, when visitors can go aboard between 10am and 4pm and discover what life was like for the men manning a lightship, in some of the very worst conditions at sea. The event listing at the new website is a work in progress, with new details arriving every day. There is still plenty of time to organise activities and share details with the whole county, or plan an event that could just win a ‘Northumbie’ award – one of the very special, fused-glass creations made by local glass artist, Helen Grierson, which reward participation in Northumberland Day. There is also still time to join one of the growing list of sponsors of the ‘Northumbie Awards, picking a category to support, at a very affordable cost. We already have some great sponsors, but there’s room for more. In fact, it’s surprising that, for such a low cost, more businesses haven’t demonstrated their passion for the county in the same way as all the volunteers, pupils, villages and organisations. Talking about the new marketing collateral, Jane says: “There was so much positive feedback from exhibitors and attendees at the North Tourism Fairs that I knew it was time to give the initiative a more deserving online home and create materials that will help schools across the county get involved. “Since launching the new site yesterday, there has been an amazing response, with more event details instantly coming in. Northumberland Day 2018 is set to be even more vibrant than last year’s event and we cannot thank passionate villages like Norham, Boulmer and Beadnell, or groups like the Friends of LV50, enough for their support and the can-do attitude that makes things happen. “I must also thank those offering continued support into year two and all those now getting in touch, asking how they can enjoy some of the fun. The answer is that they can contact the Northumberland Day office by emailing NDay@catapultpr.co.uk or ring 01253 891114.